We both have quite the sweet tooth and actually bonded over our love of treats on our study abroad to Paris where our host family liked to feed us generic cornflakes and hotdogs with sauerkraut instead of all that is delicious in France. We were basically forced to sample all the neighborhood patisseries to really immerse ourselves in the culture. 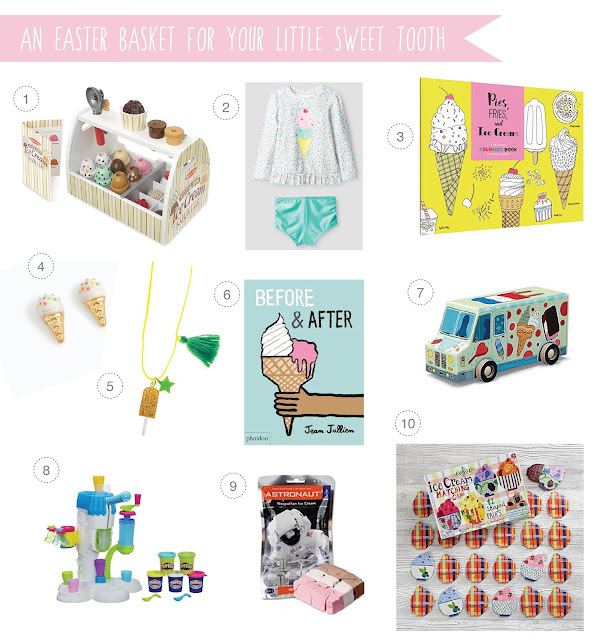 This basket is for all our kindred spirits out there and your mini sweets lovers. 1. Melissa & Doug Wooden Scoop and Serve Ice Cream Counter- I like Melissa and Doug for a lot of reasons, and I especially like their food-themed toys. They are sturdy, perfect for a wide range of ages, and they have a reasonable price point. This ice cream set is darling! My 9 year old niece has it and everyone, from my 2 year old on up loves to play with it. The serving case and accessories are fantastic. 2. Cat & Jack Ice Cream Rash Guard Set - A sprinkle covered swim top, yes please! Add in those minty ruched bottoms and the ruffled hem and we've got a winner. I'm a huge fan of suits that come with rash guard tops, we spend so much time by the pool in the summers that it is nice to not have to worry so much about a whole torso getting sunburned and reapplying sunblock to every single body part. Cute, plus less work for me, I'm in! This style is available for babies and toddlers but if you're looking for someone out of the toddler set check out this equally adorable one piece. 3. Pies, Fries, and Ice Cream: A Delicious Coloring Book for Food Lovers- We've advanced past the basic coloring book in our house, at least for my oldest, and these more involved books make coloring time something I look forward to. Pair it with some colored pencils and you are good to go. These are our favorites- they're specifically designed for developing artists by offering the blendability of the regular Prismacolor Premier line with a stronger core. 4. Crewcuts Girls' Stud Earrings- Okay, I admit it, I want a pair of these for myself. Classic vanilla with sprinkles on top, how can you go wrong? 5. Gunner and Lux Popsicle Summer Necklace- I'll take one of these too please! 6. Before & After by Jean Jullien- We were sold on graphic artist Jean Jullien's work after This Is Not A Book, maybe one of the only wordless picture books that has made me laugh out loud. Fun, colorful, and spot-on design. 7. Crocodile Creek Ice Cream Truck Puzzle- We're a puzzle family and thanks to a friend I've gotten back into puzzling myself. I'll tell you a secret, sometimes I do 1,000 piece puzzles when my husband is traveling which makes my kids want to get out all their puzzles too. I may or may not have a fantasy that involves all of us working on 1,000 piece puzzles in a snowed in cabin by a crackling fire, oh and the cabin is magically without electronics except for a record player and land line in case of emergencies. 8. Play-Doh Perfect Twist Ice Cream Playset - Play doh is one of our essentials, both my kids love it and they are able to entertain themselves for quite a while with it. This deluxe set may make all their ice cream dreams come true. If you're in the market for a smaller set, we love this one too. 9. Astronaut Ice Cream- This is the number one thing my kids ask me for in any science museum gift shop. This and those bags of rocks you can fill for $5. But I digress, how fun would it be to put in their baskets this year? My husband can't resist this stuff either. 10. eeboo Ice Cream Matching Game- I've been a fan of eeboo for years, the quality is wonderful and the designs are darling, this Ice Cream Matching Game is no exception.